So far the hardest thing about sticking to my low carb diet is just… other people. Everybody else’s food always looks better than mine. It’s so unfair. An example: It’s lunchtime, and I’ve made chicken noodle soup for my kids, and chicken kale soup for myself. I love my healthy kale soup, I really do. But I would love it sooooo much more with a handful of those tasty egg noodles thrown in. But paleolithic humans didn’t eat pasta, so neither can I. There is a noodle workaround though, if you are brave enough to try it. My sister found these things called Shirataki Noodles. They look and feel like noodles but they have zero net carbs and zero calories. Miraculously. But how? You might well ask. Is it really a miracle or is some sort of dark magic at play here? 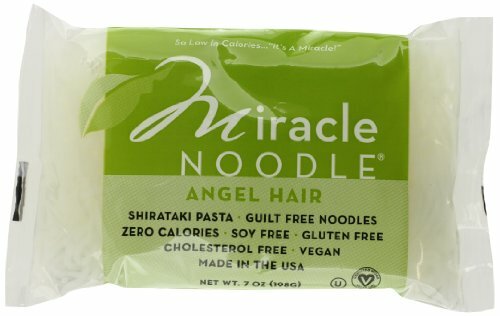 Well… Shirataki Noodles are made from the roots of devil’s tongue yams, so I’m going to go with dark magic on this one. These strange noodles are edible, but not digestible. So you can eat them, but your body can’t digest them. They just pass through you like a spirit. Or a ghost. They have no nutritional value and give you no food energy, but they do a very good imitation of a noodle, I’ll grant them that. They’re chewy like cellophane noodles, and like cellophane noodles, they don’t really taste like anything. This is good news, because they smell very very strange. The package instructions recommend boiling them in order to “reduce the authentic aroma”. And by “authentic” they mean “incredibly stinky”. So I’m not going to lie, shirataki noodles are pretty weird. They smell odd when you open them, and are tasteless after you boil them. But if you add them to a soup or a sauce with a lot of flavor, then you might just have something. I’ve been adding them to my Turmeric Broth with Chicken and Kale. It’s not miraculous, by any means, but I do feel less jealous of my kids’ soup. That’s something. This recipe for low carb turmeric broth is very versatile. It’s a great base for any kind of soup you can come up with. 1. Peel the fresh ginger, garlic and shallots. 2. Chop them up roughly. A food processor or professional blender can be used for this step. 3. Saute the ginger, garlic and shallot mixture in olive oil for 7 minutes. 4. Add the turmeric, cumin and coriander and saute for another minute. 5. Add in 6 cups of broth, 2 cups of water and 1 teaspoon vinegar. Drop in a nice chili pepper in if you like that sort of thing. 6. Simmer for 15 minutes or so. 7. Strain out the aromatics and the chili pepper with a sieve. 9. Return the broth to a simmer. 10. Add in kale and simmer for 15 minutes until it wilts. 11. Add the cooked chicken and noodles and cook just enough to warm them. If you liked this low carb soup recipe, then you might like my recipes for Chicken Sausage and Shrimp Gumbo, Chili Con Carne or Chicken Ramen Noodle Soup.